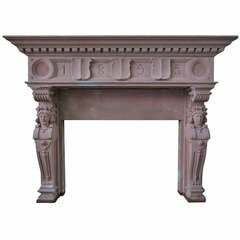 Embassy-quality fireplace Renaissance Caryatid statues dated 1895, France.'. 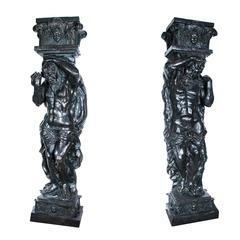 About These highly decorative composition Herms depict a Caryatid and Atlas. Suitable for interior or exterior use. The urns held above the heads have previously been used for plants. European origin, possibly Italian. 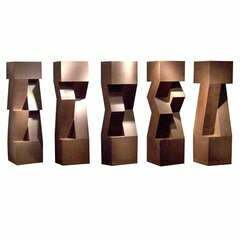 Condition report: Constructed from fibrous cement, they are hollow and have a distressed paint finish. There are areas of paint missing, surface cracks and surface losses. The statues are in a structurally stabile condition. The fiber reinforcement is glass, not Asbestos. Style: Classical Date of Manufacture: Second half of the 20th century Wear: -Wear consistent with age and use -Minor Losses, scuffs and scratches. -Historic Repairs -Recent Repairs Dimensions: Height Female 183 cm, male 181 cm Width: Female 51 cm , male 53 cm Base female 33 x 32 cm Base male 32 x 33 cm Weight 78 kg. 20th century Portland limestone craving depicting Lazarus in a conch shell. Weight 450 kg. Art Nouveau ceramic caryatid, circa 1900. Monogrammed "D". Caryatid in Bouffioux sandstone realized by Guerin. Inspired by Artus Quellin, 17th century.